Wildcard has announced that split screen, for both local play and online multiplayer, will be coming to Xbox One in the next patch (v731). Currently there is no ETA available for the next patch, but we think that it won’t be taking that long (as patches were intended to be released every ~2 weeks). Earlier announcements stated that split screen could not be combined with playing online, but it seems this is not the case anymore. Split screen will also come to PC in the future, but an exact release for this is still unknown and no reports indicate that it will be anytime soon. We hope you are as excited as we are, and if new information becomes available we will make sure to share it with you guys as soon as possible. Get your couch ready for some old skool couch co-op and go on an adventure through ARK: Survival Evolved together! I’m sooooo excited! Thanks wildcard you guys are awesome! Hey are we ever going to get mod kits on xbox one? I would like to see dino armor sometime in the future. i think that would be insanely awesome. I also think it’d be cool if you could find larger dinosaurs for example: in real life Trex varied in size. I think that would be something cool to add to the game. 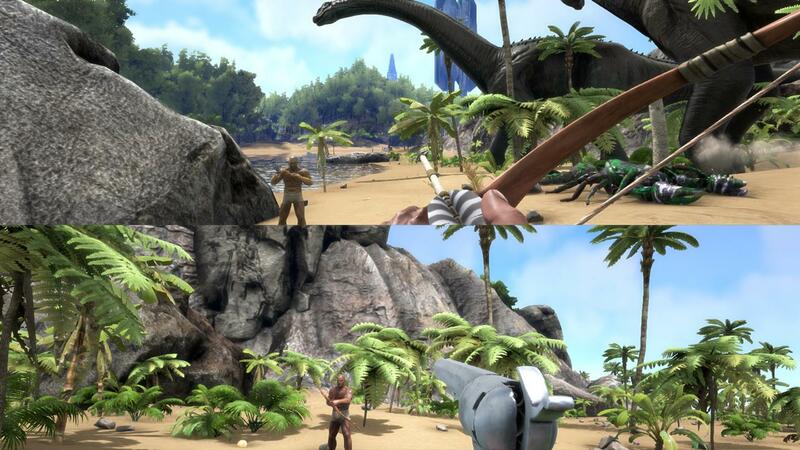 or like as you level up you could have the option to slightly increase the size of the dino. I love the game and cant wait to see what you guys do next. Thank you for bringing it to Xbox One!! !